Actor Jung Suk Won published the photo from the scene of birthday party for Choi Woo Shik. On March 26th, 2012, Jung Suk Won tweeted on his Twitter account, “Congratulations on birthday of Do Chi San,” and at the same time uploaded a photo. The day is the birthday of Choi Woo Sik. Do Chi San is one of the personality character in the SBS drama Rooftop Prince, and is played by Choi Woo Sik. The transformation of disguising as woman, the acting of showing the hypocritical eyes, seizing the audience’s eyes. 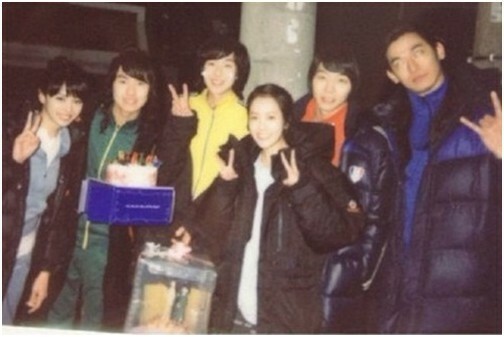 In the photo, the main actors of Rooftop Prince, Park Yoochun, Han Ji Min, Jung Suk Won, Lee Min Ho, together with crew members gathered together to prepare the birthday cake and elebrate the birthday of Choi Woo Sik. Netizens commented on the photo, “Happy Birthday Choi Woo Shik,” “Rooftop Prince shows the care between actors,” “Rooftop Prince is very interesting, has been waiting for the broadcast” and so on.